Harrington is a rural community of about 400 people in Lincoln County about an hour west of Spokane. In 2012, it was one of several communities whose library received a high-speed fiber connection as a result of the American Recovery and Reinvestment Act. The Lincoln County Public Development Authority (PDA) believed if their entire downtown – not just the library — could access broadband, then people interested in a rural lifestyle might consider relocating their businesses there. Knowing that Harrington is too small for a large private internet service provider (ISP) to make the investment needed to bring service to its citizens, the Lincoln PDA made a deal: It asked the library’s private ISP to become downtown Harrington’s provider. With funding from local tax revenue, the PDA purchased the necessary equipment, the provider installed it and committed to maintain service to the downtown area. The project went live. Just two years after formulating a plan, Harrington had gigabit internet service with equipment purchased, owned, and operated locally — which cost the PDA less under $10,000. Harrington Mayor Justin Slack said his family moved to Harrington from Seattle in 2013. Slack said ‘The Post and Office’ currently serves the Harrington community with a high speed connection, and allows local residents to maintain their urban jobs at companies like Microsoft and Indeed.com. Nearby, the historic ‘Electric Hotel’ is being renovated and a new storefront that sells jewelry and artwork is exploring e-commerce. “It just goes to show that with a little help from government, some local dollars, and community support, we can make a big difference in rural Washington,” Slack said. That’s the difference Gov. Jay Inslee hopes to see in more communities statewide. 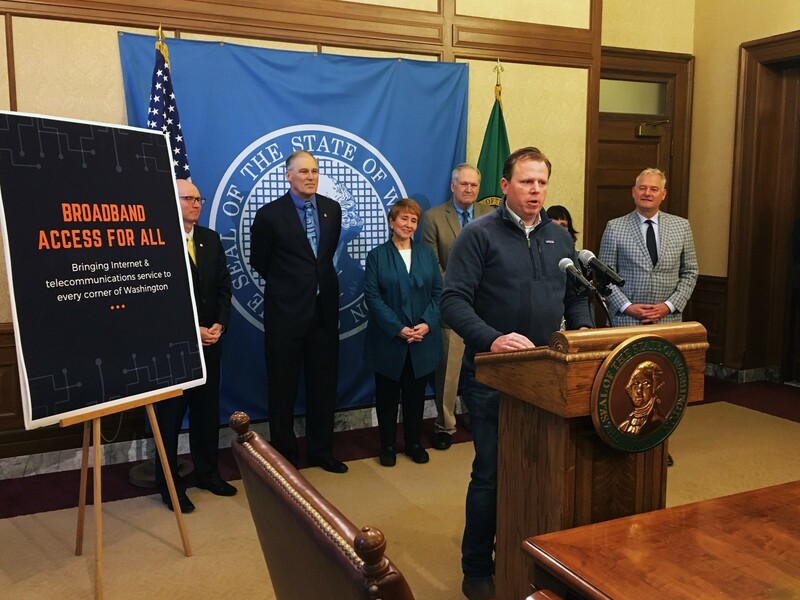 Today, he was joined by Slack as well as legislative and tribal leaders to detail his proposal to expand broadband. 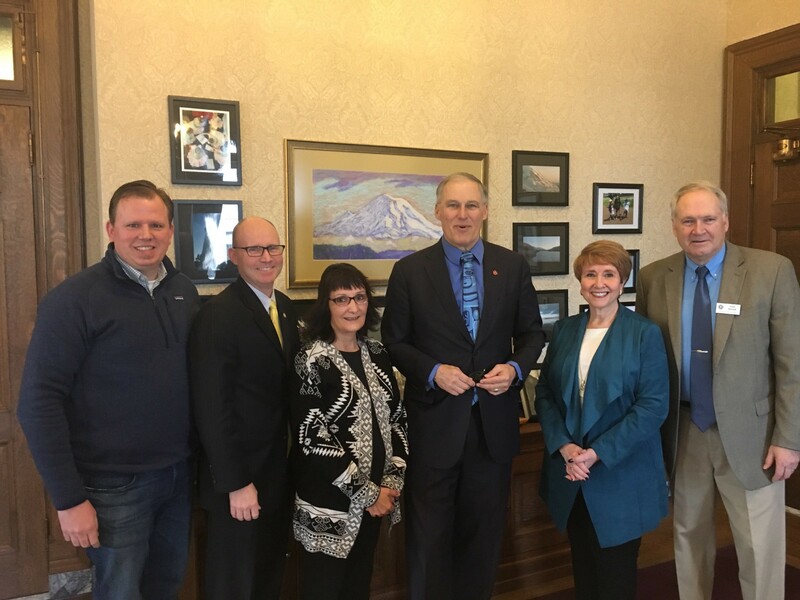 Inslee proposes a new Statewide Broadband Office (SBO) to serve as the central planning and coordinating body for public and private efforts to deploy broadband at the state level. The SBO will be an information clearinghouse for local, state and federal programs. It will set high-level policy, develop and implement a statewide plan, and incentivize deployment of quality and affordable service to Washingtonians in every corner of the state. The governor’s budget also includes funding for a competitive grant and loan program to be administered by the Public Works Board. Funding will be awarded for the acquisition, installation, and construction of infrastructure that supports broadband services, and to fund strategic planning for deployment. The governor’s proposal also recognizes the need to work with both public and private sector groups to support innovative delivery methods, including promising new technologies like airband (used in radio communications) and low-orbit satellites. Inslee’s broadband plan was informed by what he heard last summer when he embarked on a three-day tour of the state. 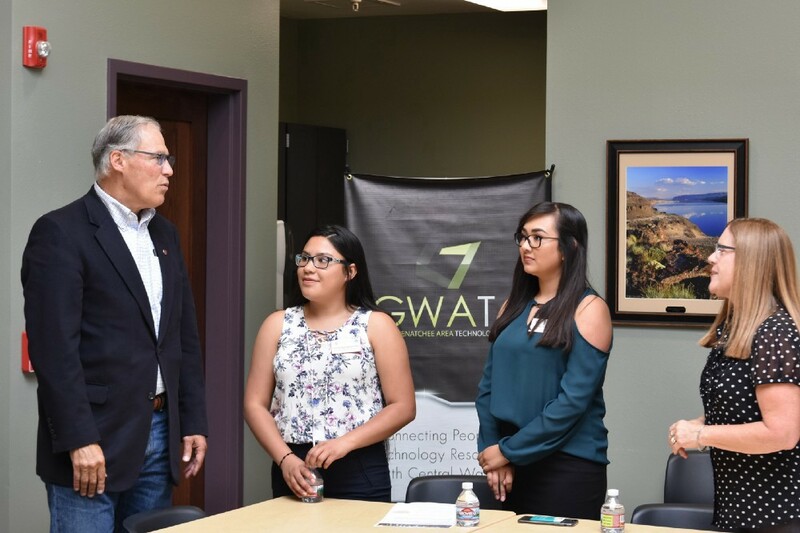 He heard how crucial broadband access is for businesses, students, healthcare providers, tribal communities, and public safety advocates in areas with no access to reliable internet connection. A lack of quality broadband impacts kids trying to do their homework, entrepreneurs hoping to launch a startup, and rural employees who work remotely for companies in bigger cities. Federal data grossly underestimates how much of Washington is currently served by broadband. This proposal continues work that Inslee began last year. In July, he signed a memorandum of understanding with the Quileute Tribe, the UTC and CenturyLink that will bring high-speed internet to the tribe’s Lower Village, as well as to property outlined in the tribe’s Move to Higher Ground project. The project moves key parts of the community, including the tribal school and senior center, out of the tsunami risk zone. Last session, the governor helped secure $10 million in Community Economic Revitalization Board funding for broadband projects in remote areas, and signed Senate Bill 6034 and House Bill 2664 into law. SB 6034 allows Kitsap Public Utilities District to provide retail broadband service to its customers under narrow circumstances, and ensures that Kitsap PUDs customers don’t lose the service they already have. HB 2664 made sure that all port districts in the state have the ability to acquire and operate broadband infrastructure for wholesale services to ISPs. When Inslee was in Congress, he worked on legislation directing the Federal Communications Commission to identify unused bands that could be used for broadband access.